Editor's Note: This story is reprinted from GamePro. For more iPhone game coverage, visit Gamepro's iPhone section. Poker With Bob by Scary Robot Productions is a simple draw poker game in which you play one-on-one hands against a single opponent, a fully-voiced and animated A.I. jerk named Bob. 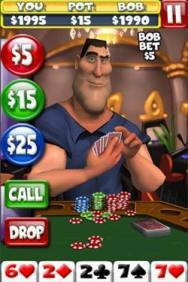 Bob makes exaggerated facial expressions and acts as the permanent dealer while you duel him, giving the game a bit more personality than most other of its kind on the App Store. For those who’d rather play with a real person than Bob, local multiplayer via Bluetooth has been included. Bob looks and acts like a jerk. A realistic jerk, but a jerk nonetheless. Poker with Bob’s biggest strength is the quality of its presentation. Bob’s 3D model looks good enough, and it’s pretty cool that the game is fully voiced. It lends the whole thing a bit more character than its competitors, and someone looking for a clean, easy-to-get-into poker game should be satisfied by what it has to offer. But while Poker with Bob sounds like a lot of fun in theory, but I found that in practice it can be a bit frustrating. While Bob does come loaded with quite a few animations and voice clips, these tend to get old pretty quickly, and you’ll soon find yourself wishing you didn’t have to sit through his animations to get your cards. I was also pretty bored by the actual gameplay, which was for me like a war of attrition that was impossible to end quickly. On the rare occasions that I’d actually get a decent hand, Bob would always fold before I could get the pot anywhere near where I wanted it. As a result, games against Bob tend to take forever and feature little to no action. Poker with Bob could certainly become your go-to poker app, but I got tired of Bob’s antics and the game’s slow pace, and likely won’t be returning. Is it worth the price of admission? Although I was disappointed by Poker with Bob, it is priced at $0.99, so you can see for yourself if the game is worth it at very little cost.